Ceramic band heaters are designed with spirally wound inner resistance coils evenly threaded through interlocking insulated ceramic “tiles”. The ceramic core, or “mat” of tiles is housed beneath a stainless steel sheet with serrated edges. The notched edges fold over to secure the ends and a protective inner liner (to be removed at installation) secures the placement of the tiles. 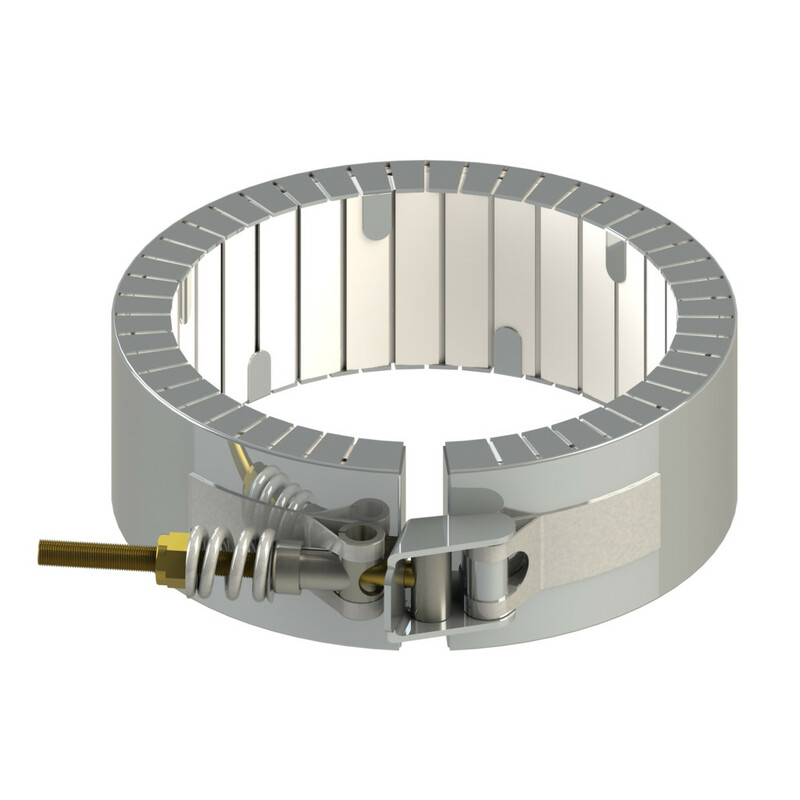 This combined assembly of the Ceramic Band Heater offers a flexible heating system that yields efficient transmission of conduction and radiated heat. 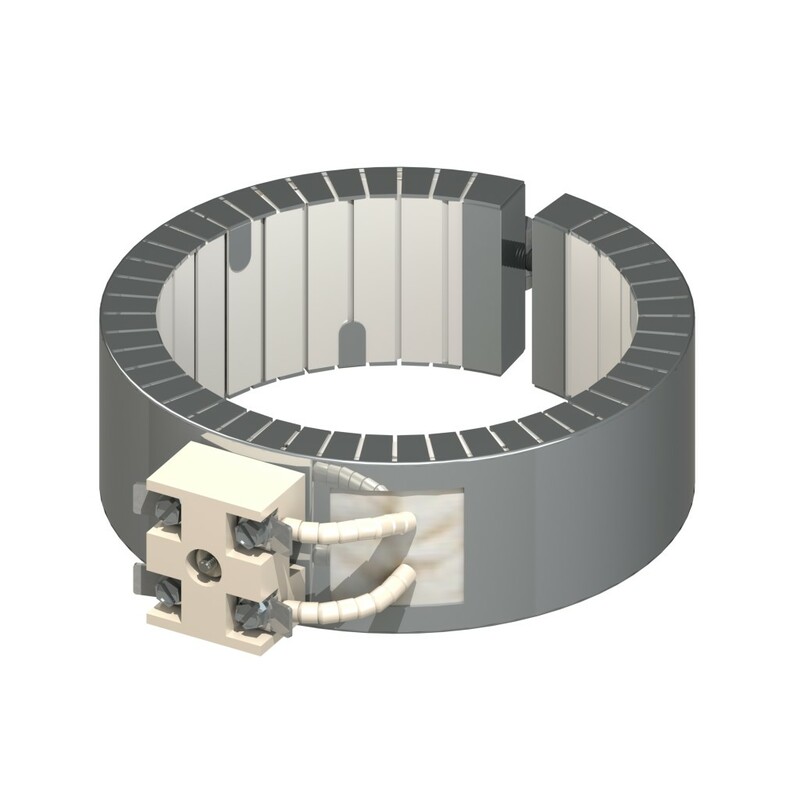 The heat of the Ceramic Band originates from the inner coils that conduct heat at maximum temperatures. 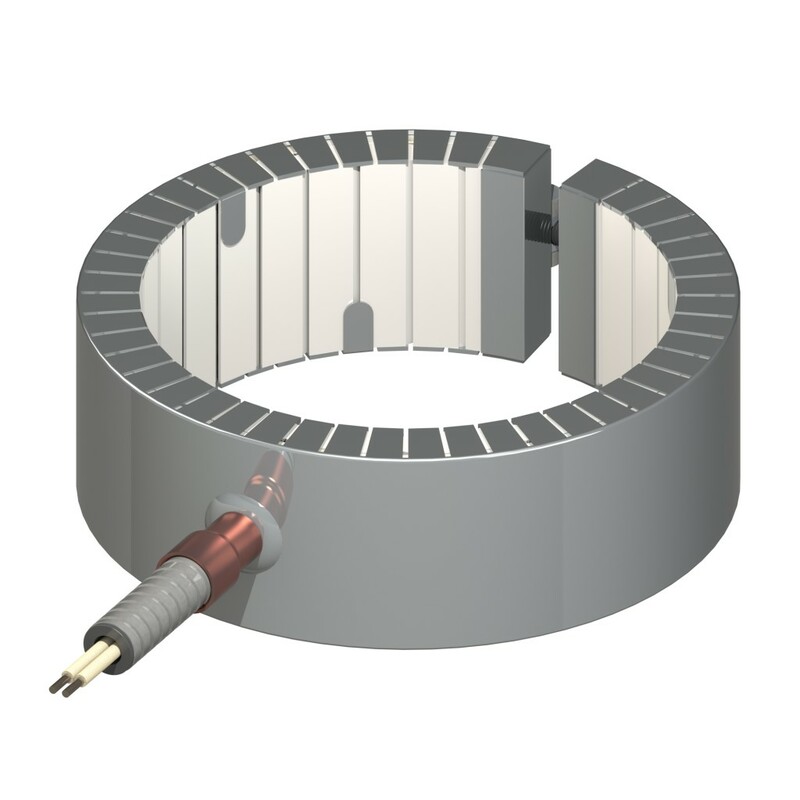 The heated coils evenly deliver heat through the ceramic tiles which radiate energy to the barrel. 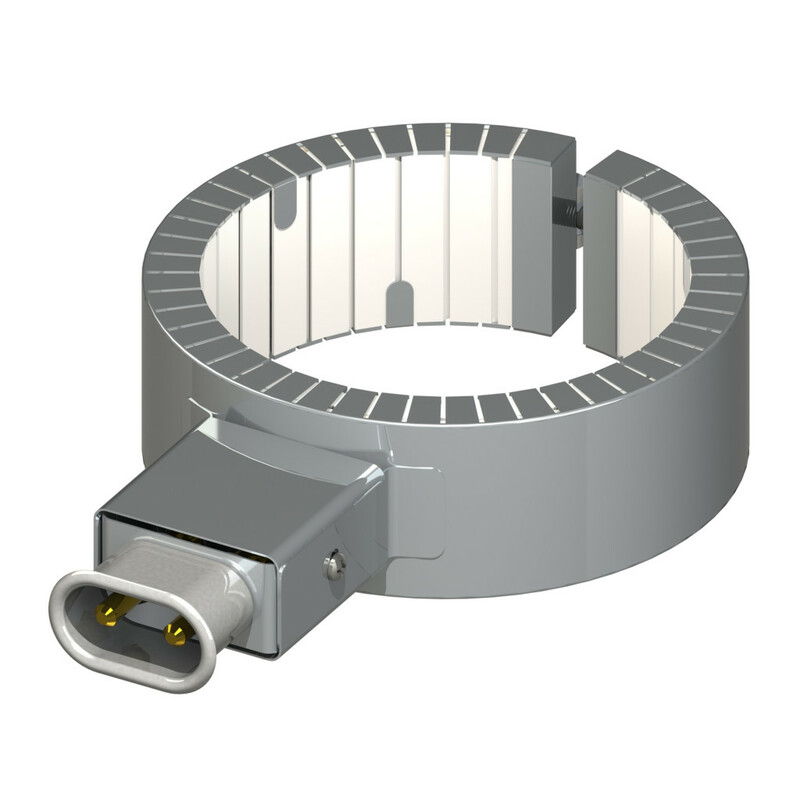 We offer a variety of Ceramic Band styles from standard to custom configurations. When selecting a ceramic heater, select a heater that best matches the wattage requirements – to decrease the frequency of cycling and temperature overshooting and thereby increase the life of the heater. 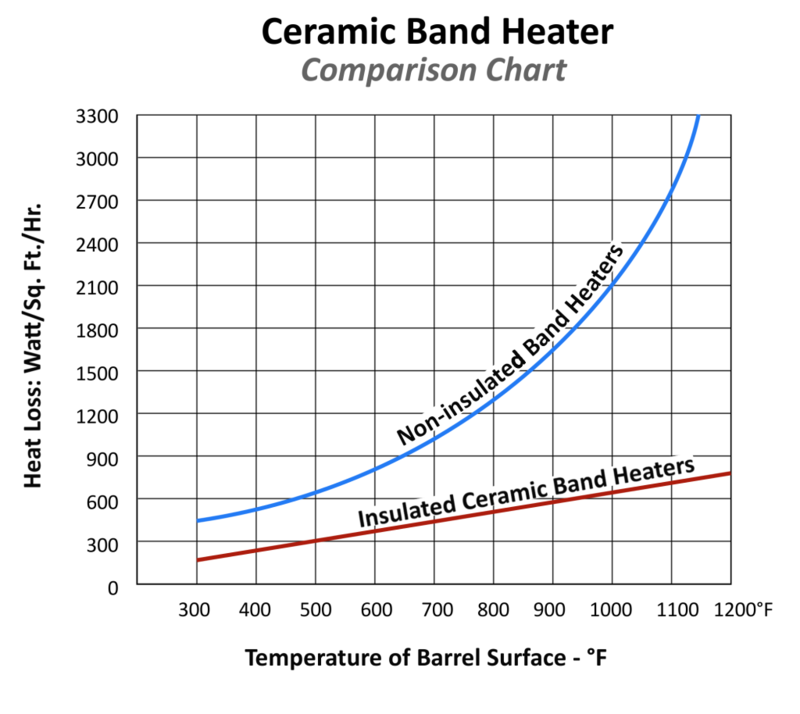 When installing a ceramic band heater to replace a non-insulated heater, decrease the total operating wattage by approx. 15-20 percent. 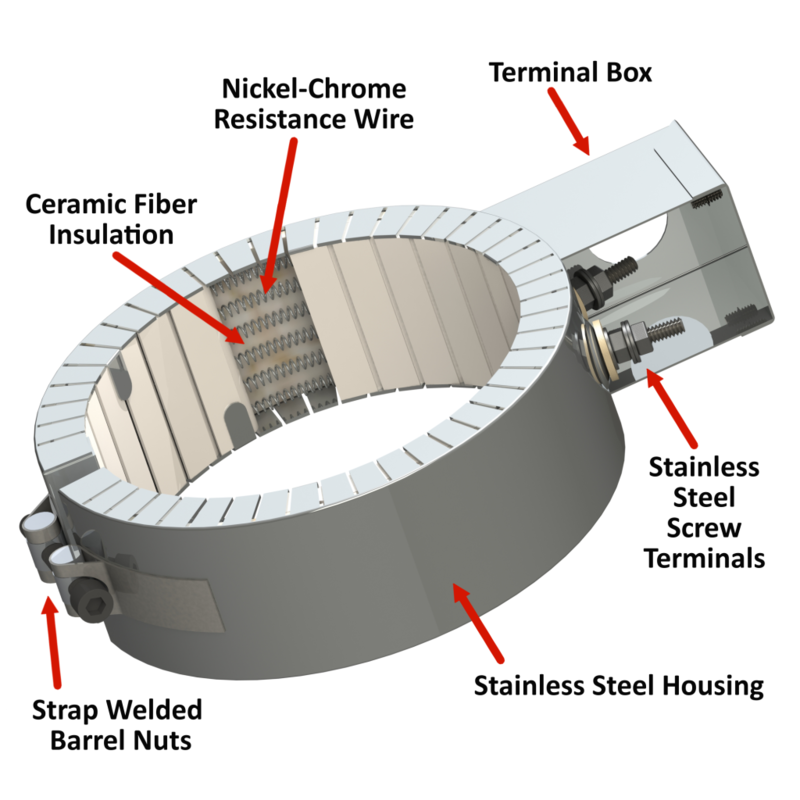 The use of Ceramic Band Heaters inserts to support high-temperature nickel-chrome resistance wire allows the Hampton Controls ceramic heater band to operate at temperatures reaching 1,500 degrees Fahrenheit. Other Cylinder Heating Applications also. Built in insulation minimizes unwanted change in temperature along the barrel. Efficient heat transfer: Heat transfers through radiation, conduction, and convection, so a perfect fit is not required compared to other band heaters. Heat transfers are not affected by irregular surfaces or a loose fit. Because they operate at higher watt densities, they can be used in wider increments. The number of bands used can be reduced with simplified wiring. The heater is safer with the cooler external surface – over other band heaters. The flexible design allows easy install and removal. 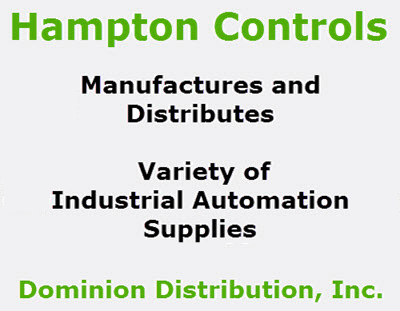 Hampton Controls provides several clamping variations for our Ceramic Band Heaters. 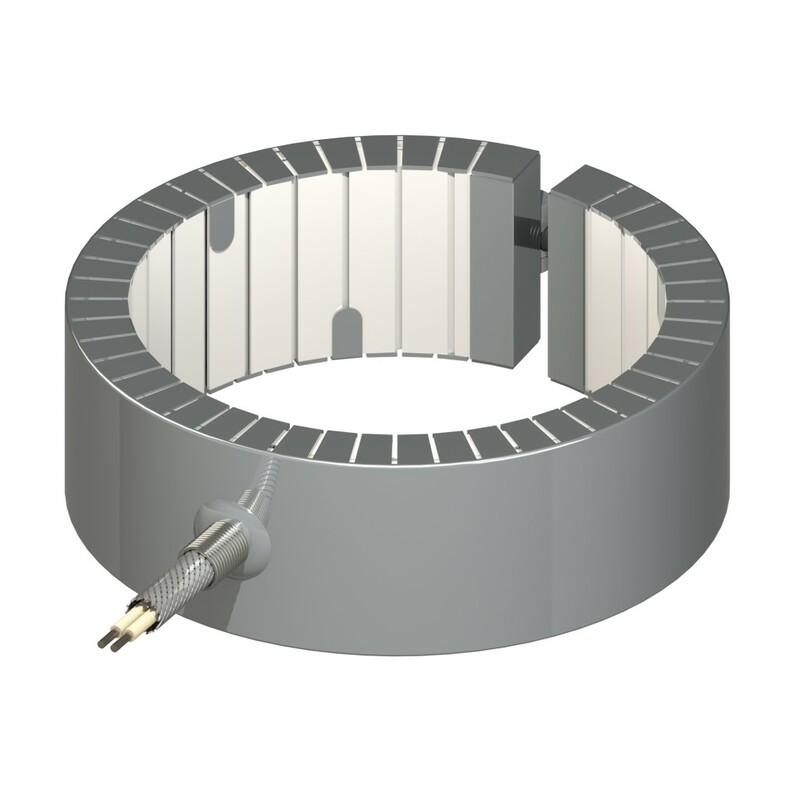 Built-in barrel Nuts are excellent clamping option for heaters with holes or cutouts. No strap to loosen or adjust. Mounting bracket with barrel nut lockup, with 1/4-20 screws. Can be supplied in any construction or termination variation. 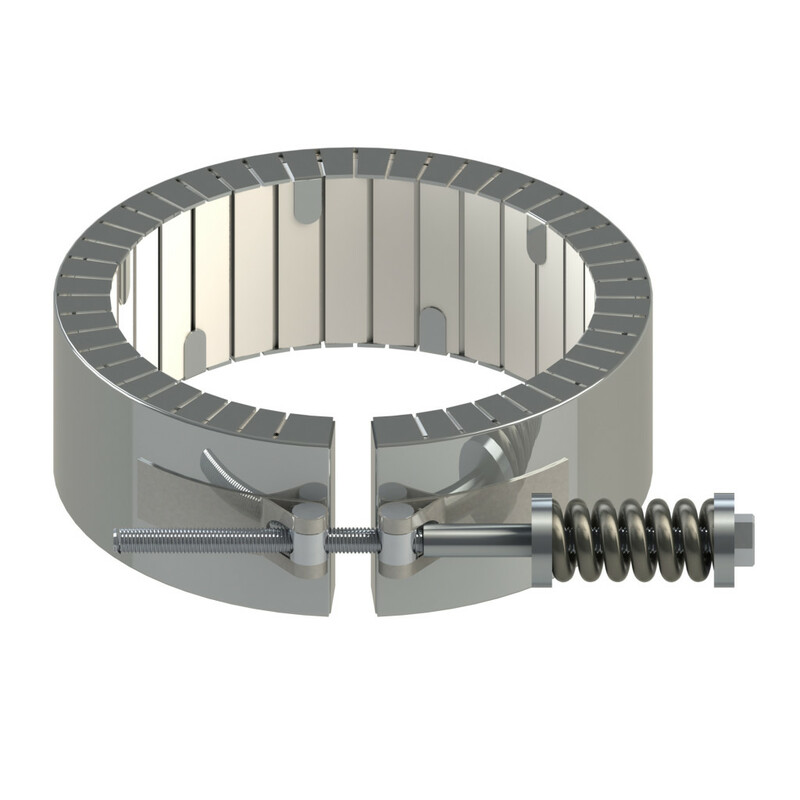 This barrel construction includes spring loaded clamps to flex during thermal expansion of the metals. 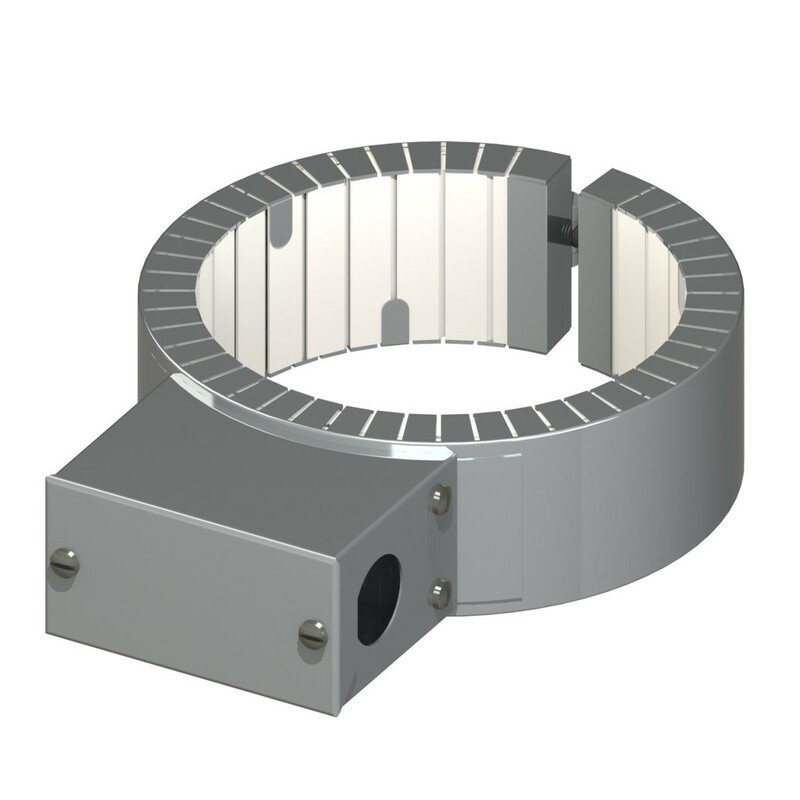 Flange clamping is standard on all heaters as in standard construction description, unless otherwise noted. Spring loaded latch & trunion is a quick release. Recommended l.D. 12" or greater. 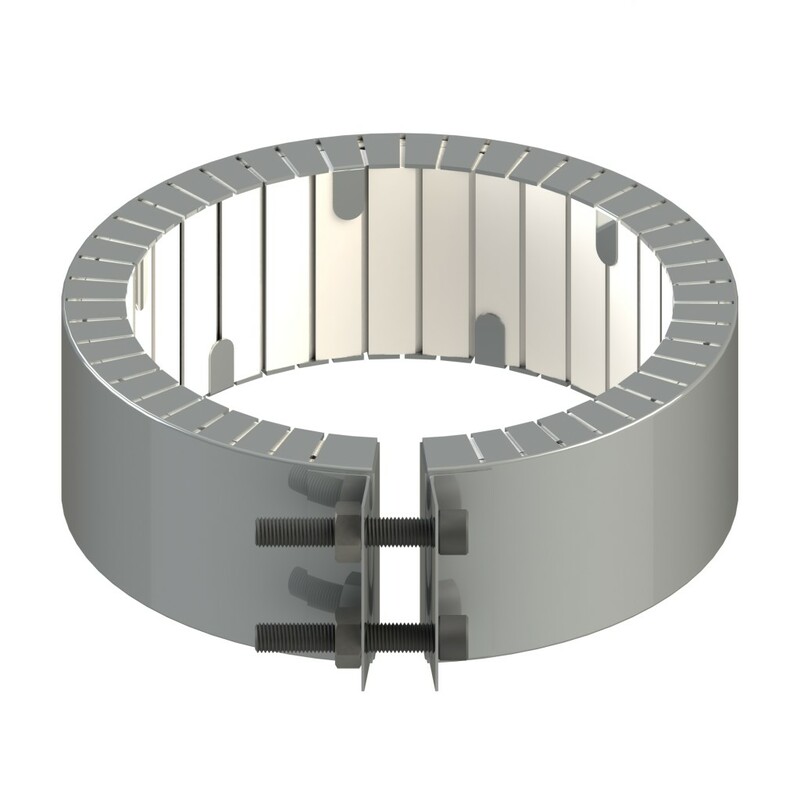 This Latch and Trunion variation is ideal for Ceramic Band Heaters exceeding 12 ” in diameter regarding absorbing thermal expansion and for a secure installation on large bands. You have several termination variations for our Ceramic Band Heaters. This Ceramic band style features protective ceramic beads (encasing the lead wires ) exiting the ceramic terminal box. The Euro Plug (short for European) is an easy and safe application for applying power. The design combines high temperature and the quick disconnect plug to eliminate live wiring and exposed terminals. Quick disconnect cup assembly is a safe way to provide power to heater. Min Width 1-1/2", Max. AMPS 15 at 240V, MAX Volts 240. When ordering Ceramic Euro Plug with Box, specify either a vertical or horizontal plug configuration. This Ceramic band includes fiberglass leads. The leads are covered and secured to the band by a spring relief component. 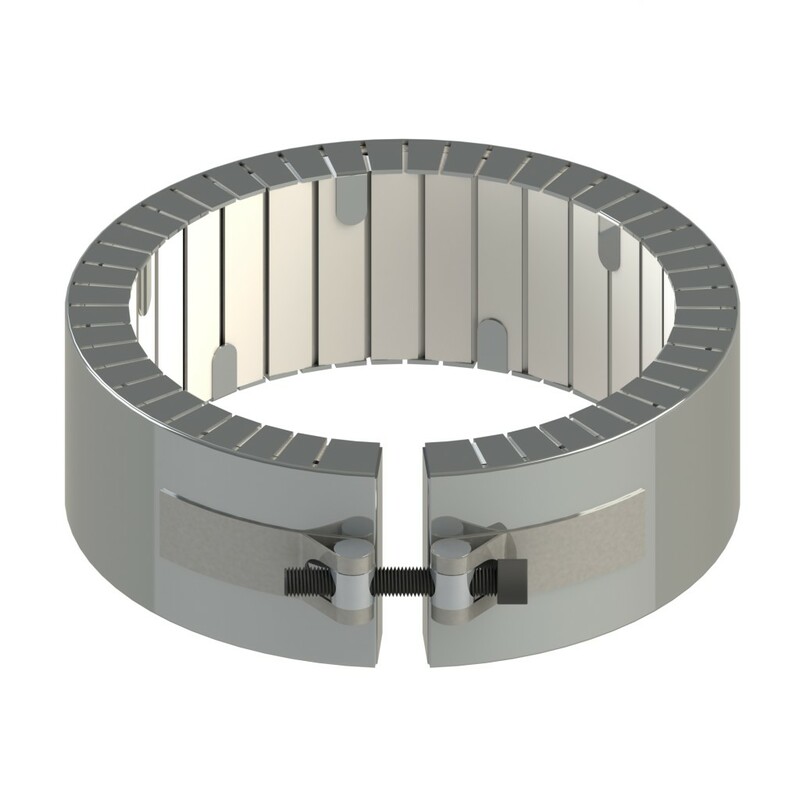 This variation bears a metal braid that provides significant flexibility and abrasion protection. Protection of fiberglass leads, used to provide abrasion resistance, electrical grounding and where clearance is limited. Leads exit one point of heater surface through a strain relief. 10" braid over 12" leads. Min. I.D. 3", Min Width 1-1/2". This style depicts fiberglass leads covered with a protective armor sleeve. 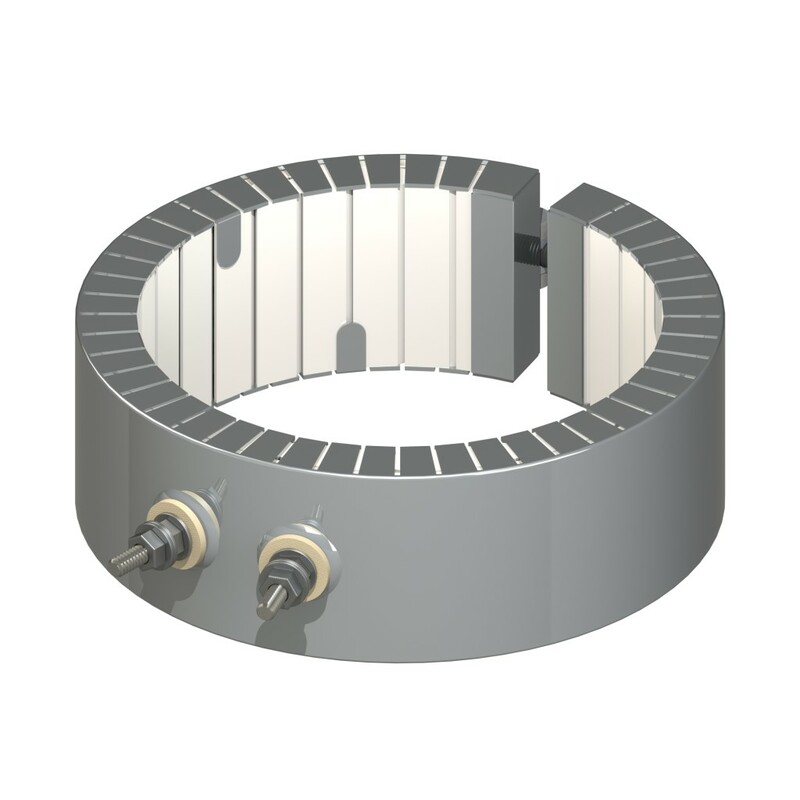 The sleeve assembly is affixed to the band by a copper coupling. This Style can be constructed with the terminals positioned either Vertically or Horizontally . This design is the most common termination. Placed parallel with the width of heater with 10-24 or 1/4-20 post terminals. Located 180° from gap. Standard on all heaters greater than 3" width. Min I.D. 3", Min Width 3". Be sure to specify the option you desire when you place your order. This Style can be constructed with the terminals positioned either Horizontally or Vertically . This design is the most common termination. The terminal location is typically 180˚ from the gap, center line with length of heater with 10-24 or 1/4-20 post terminals. Standard on widths under 3". Min l.D. 3"
There are several lead options available for this ceramic T-Box style. Designed in standard height of 1 3/4" high, with 5/8" conduit knockout for standard metal hose connections. Protects terminals from damage, spill leakage, grounding or short circuiting. Available for single or 3 phase construction. This variation is without insulation. This style is suitable for air cooled applications. Every Ceramic Band is specially configured to your specifications. Please fill out the information below and it is Important to NOTE: All fields are required. 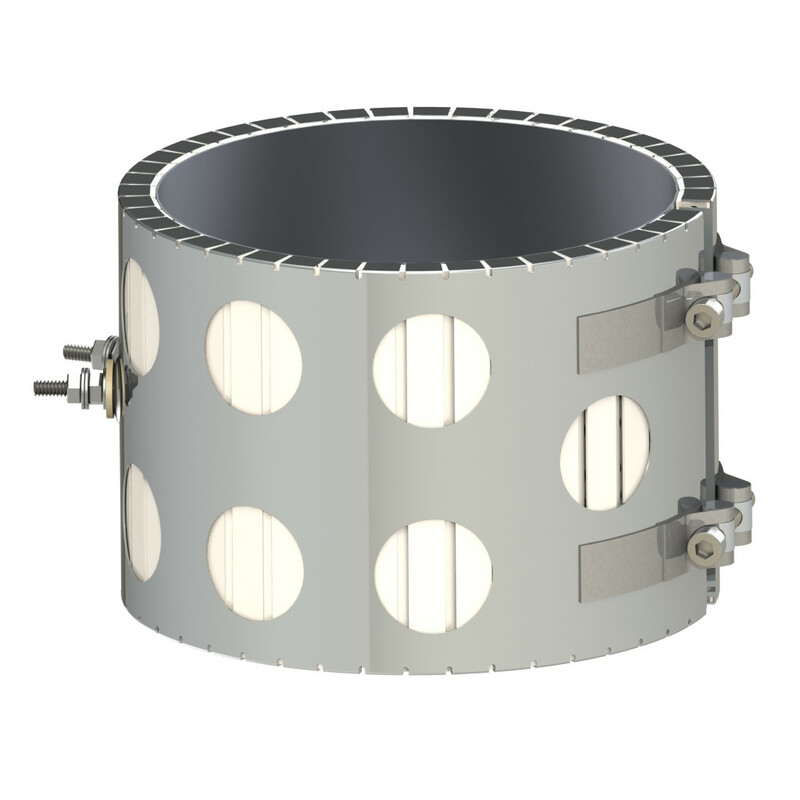 See our Large Supply by Clicking on the Stock List Tab above or Configure your Band Heaters here.